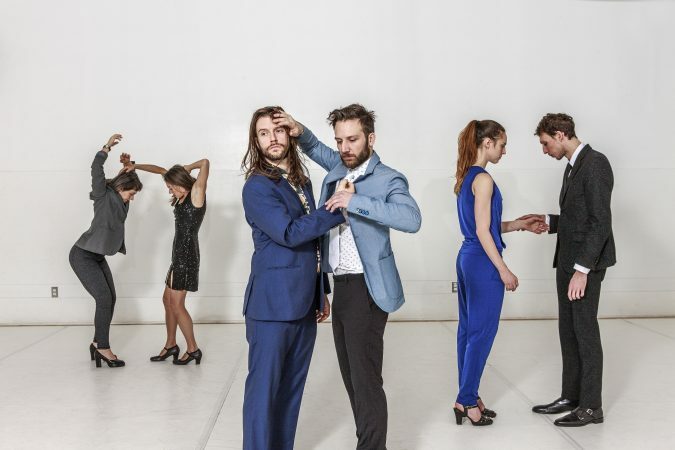 Frédérick Gravel’s dance works overflow with contemporary cool. The dancers pose nonchalantly onstage, drinking Coronas, as the audience takes their seats. They look like they haven’t a care in the world and like they’re too cool to do anything conventional or expected. This was confirmed right off the bat as one of the dancers gradually manoeuvered himself to be hanging off the stage, one foot balancing on an arm rest. Set to live rock music, also by Gravel, the nine dancers beautifully translated the music into movement. Another trademark of Gravel’s works is his dry sense of humour and monologue to the audience near the beginning of the show. He says things like “clap at your own risk,” and “I don’t know the rules.” He explained that he originally wanted to name this piece Some Hope for the Assholes, but that was a bit too crass so he had to make a compromise. He also mentioned that the piece has two beginnings because he couldn’t decide which one he liked better, so he kept both. The first beginning, before his monologue, was in extreme slow motion with the dancers moving in and around a line of chairs across the stage. The second beginning was full of pulsing hip and operatic music with a heavy base line. Gradually this hip pulsing morphed into a scene at a night club. Dancers entered and exited the scenes with no break in the action, some sitting nonchalantly off to the side to watch a solo or duet. The most impressive moments, though, were when all nine dancers and all three musicians were so in synch that they created a powerful force of energy, releasing collective frustrations of our contemporary society. From hard rock, to rock ballads, to an acoustic solo from Gravel, the music was just as impressive as the movement in this evening that was full of surprises. For anyone who loves pure rock music and edgy contemporary dance, Gravel has composed a masterpiece for the senses.